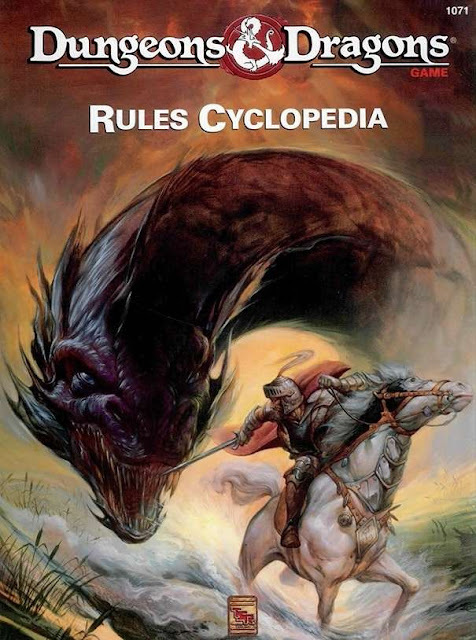 The D&D Rules Cyclopedia often called the best one-volume D&D book there is, is now "back" in print. Or at least Print on Demand. This game covers the BECM of BECMI which is really what most people want anyway. Really this book has everything. For the longest time, I dismissed this book and felt stupid for that the second I read it. At the time though I was in grad school and money was tight. I have since picked up a couple of copies. I would LOVE to run a game with this RAW (Rule As Written). I have even talked about it here many times. Now we can get copies of this fantastic version of the game in one volume in either soft or hard covers. I'd get both if I had a current game of this going. In any case, this is a great deal. Just have a look on eBay to see what these are going for used. Thanks for the tip-off, Tim. Been after an affordable copy of this for ages! I bought mine on Amazon a few years ago. It wasn't that expensive (under $30 I think). I activated it for sale today...which is why you didn't see it last week. Thanks Matt! Gee...I didn't get you anything. I guess I'm old. What is BECM(I)? Basic, Expert, Companion, Masters, and Immortals sets from the early 80s. I am ordering copies of hardcover and the softcover to see how they look. Come back here for more in about 3 weeks!